The stem or forward timber of this ship was cut from a solid piece of Angeilique. Again, very tough stuff to cut, heavy but very sturdy and rot resistant.. The stem rests on the very forward part of the fore foot and is backed by a "knee". In the first photo I am taking another piece of solid angelique down to the proper width by cutting a number of cuts that after I have chiseled away will leave me with an rough approximation of the width of the keel to which it will be mounted with 3/4 inch thru bolts. It is trimmed up with a power planer and cut to the proper angles with the big 16" Makita. So once again, the stem is not one of the boat parts you just throw over your shoulder and slap onto the boat. Its 8.5" wide by 10" deep and 10' long weighing in at probably three or four hundred pounds. So the trick is to get into place vertically and have it be perfectly straight on either side and with a slight forward angle. My weapons of choice are stacked scaffolding and a chain fall. After putting the stem in "ready" position, the knee is mounted first. Then, even though positioning everything is some thing you only want to do once, you have to dry fit the stem to the keel and the knee and make "fit" adjustments to everything so that it all looks like it should fit together. 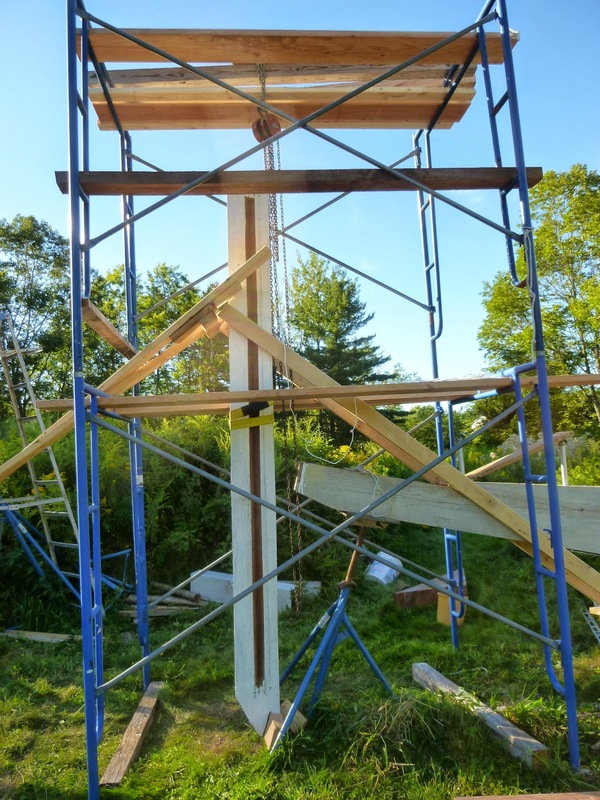 Then you take it down and slap a liberal portion of epoxy/saw dust wood dough in all the joints, hoist her up again, position her till she sits just right, clamp the whole works up, put in bracing and wait overnight for the filler to set. Then go back the next day and put in all the through bolts through the knee and tighten everything up. There's a little more to it than that- as a quick aside, this is one of the places that I cross checked my angle measurements off the plans with the digital level. We are now getting to the end of muscling up the really big stuff. There are still fuel tanks, frames and the Transom, but the big stuff is finding its way on the boat. There is also a "Goldilocks" principle in play around size. Yes size matters, but you don't want one too big because diesel engines don't like to just coast along and you don't want one too small or you may find yourself wishing for more and/or asking your engine to deliver more than it can. So, you have to select one that's just the right size. There are a couple of ways to do this. The design includes HP and speed charts that give you a sense of how much you need to keep the boat moving at different speeds under calm (no wave/no wind/no current) conditions. Then you need to add a magical number of horse power to acknowledge how it will really be on the open ocean and then, reality check it with the experiences of people who are out there cruising in ships similar to yours. In the end, I selected a 135 HP IVECCO 6 cylinder diesel that is B-rated. I was particularly fond of this model because it was one of the last naturally aspirated 6 cylinders out there AND its mechanically governed (vs electronically governed). Having some tendencies toward being a luddite, I was averse to being out in the middle of it and having the engine error code E6 come up. This is a simple and basic engine design very similar to a Cummins engine block with a good track record for reliability. It should burn about 1.8 gallons of fuel per hour at a cruising speed of 6-8 knots depending on conditions. Another interesting decision is when to put the engine on the boat. Many builders say put the engine on first and then build the boat around it- which is what I did. Many put it in later. There are pros and cons to both approaches but I will tell you that even with blue sky it was a little tense getting the engine to sit just right on the flexible motor mounts. I couldn't imagine trying to position 1200 lbs of steel through a little opening and then position it (the Goldilocks way) just right. The engine bed is a hybrid of Doug Fir cut to the shaft angle (the prop shaft runs at a shallow angle through the keel) and welded steel flat bar so that the motor mounts could be through bolted. At the suggestion of another builder I notched the wooden bed to tie into the underlying floor timbers which will help disperse the thrust across four floor timbers. Engine Room frames and fuel tanks next! They say it takes a community to raise a kid, and honestly it takes one to build a boat too. 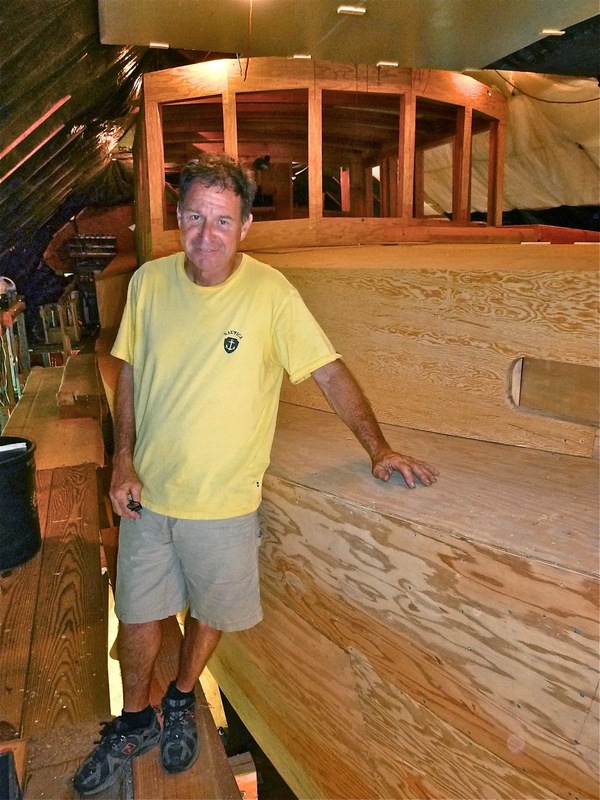 I met my friend Joe through the a web forum called "Backyard Boat Builders" which is populated by a number of builders building Buehler designed vessels as well as as an assortment of other home builders. I have found much solace and a modicum of good advice here when I have been on the fence on any of a number of building "mother may I" questions. Joe, to his credit is fond of Maine and usually makes an annual foray up north from his home state of NJ. 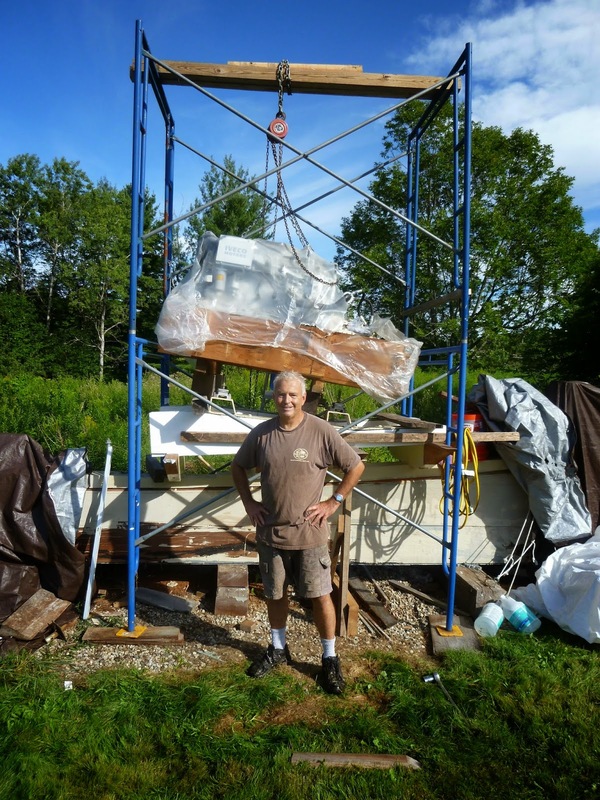 We met several years ago through the forum and have gotten together several times in Maine and in one visit down to NJ to see his undertaking- an awesome 44 foot Diesel Duck. I had seen lots pictures of both the commercial built steel versions of the Duck as well as photos of Dan Gill's Duck and pictures of Joe's Duck in various stages of construction. I have to state the obvious that there is nothing like being there and when I went down to NJ for a visit to see Joe and his project, I was awestruck by what he had already done, what I aspired to accomplish and actually stand and walk around on and in the hull very similar to the ship I was building. Honestly, physically seeing what Joe had accomplished was the ultimate kick in the pants. Seeing what he had done was such an inspiration AND he has been such an invaluable source of advice and encouragement... Period. Not only do I feel like I have a colleague, I have found a good friend. This boat building stuff is tricky, but it does have its rewards. So building out doors in Maine does have its limits, especially after a snow storm or when it is 0 degrees outside or both. How ever there are a bunch of things that can be done indoors to set your self up for the next construction weather window. Building your frame halfs for example is a great way to spend your winter evenings ;-o.
I built a frame table half sized in my cellar that would allow me to lay out and construct each half of a "frame". In the top picture I have the start of a frame half laid out on the table with the shape derived from the table of offsets that come with the plans and drawn out full sized on the frame table. These are sawn frames made of Doug Fir with 1" plywood gussets on both sides of the chine joint which is later notched for the chine log. 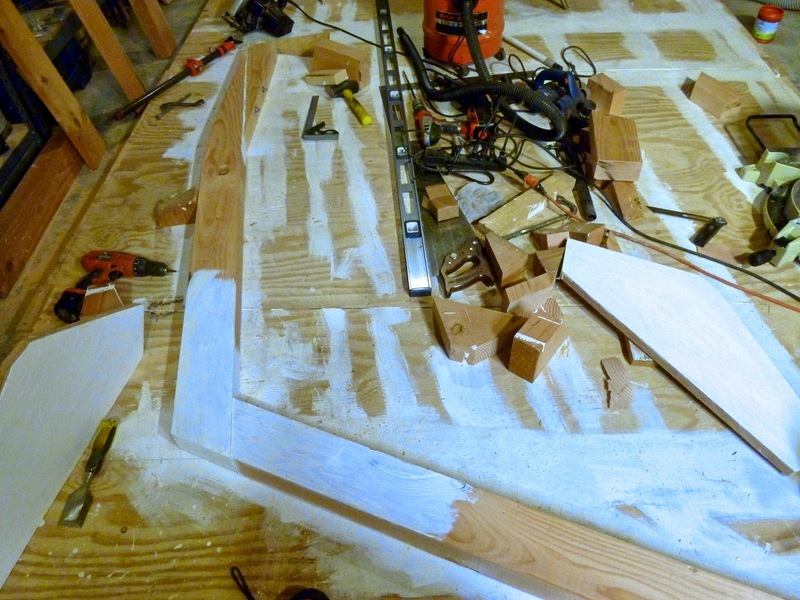 I prime any mating surface where wood meets wood- this case the plywood gussets will get mounted onto the primed area and fastened with 5/16 galvanized bolts to stabilize the joint. 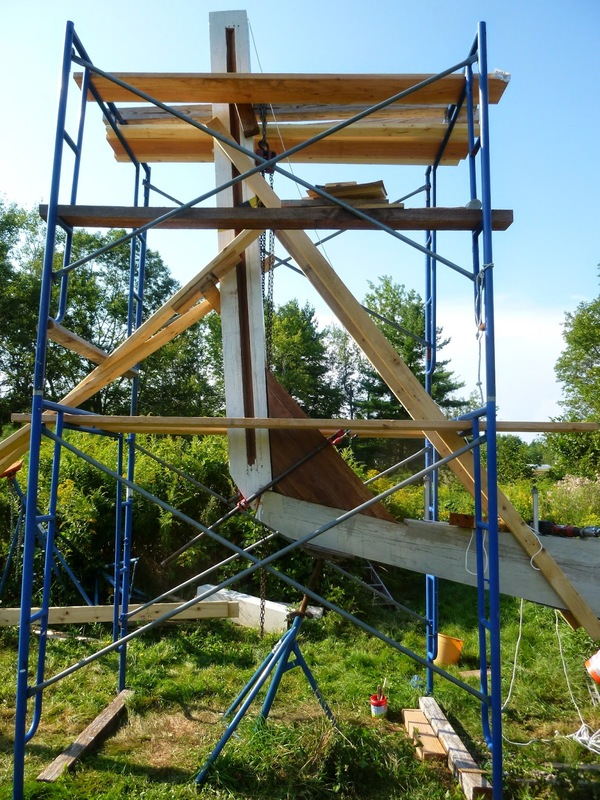 The frames are later assembled on a full sized frame table out by the keel (to be described in another post). 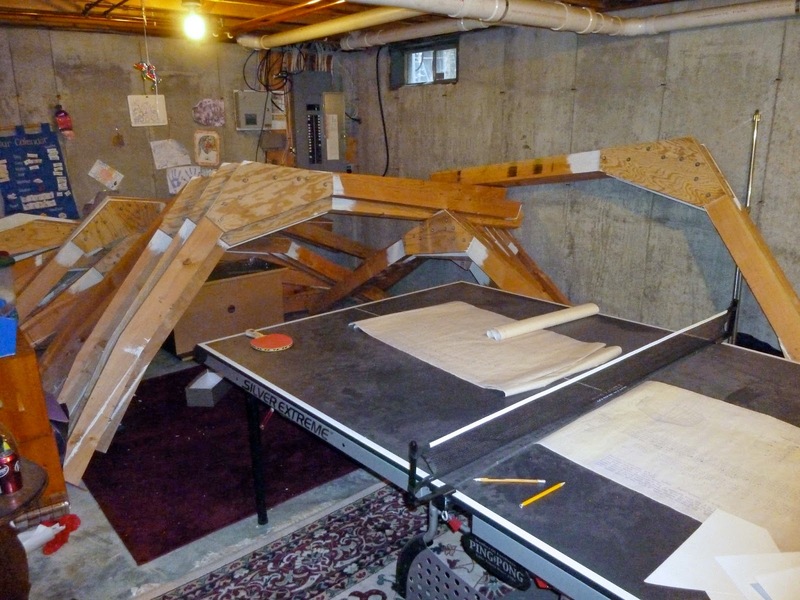 In the second picture the Frame Storage Area takes shape and the family ping pong table is taken by eminent domain as a place to review blue prints. The ping pong table has now been relinquished back to its intended recreational use now that all frames are standing- but I am getting ahead of the blog.